Your processing needs and specifications are a priority for us. We want to learn more about your business in order for us to provide a custom solution that meets all your requirements. Please provide as much information below as possible and our representative will follow-up with you. We look forward to partnering with you. 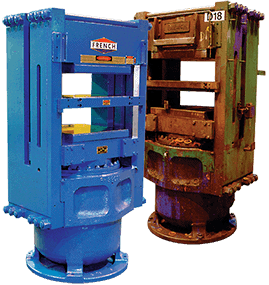 We want to provide you with the most accurate quote based on your hydraulic press or rubber mixer requirements. Please provide us a brief description of the items you will be producing and the materials to be used. If you have more than one file or document you'd like to submit, please email us. Do you currently use French or TMP equipment? Please provide us any technical specifications about your press, such as tonnage, production rate, platen size, or vacuum requirements.